Congratulations on meeting the woman of your dreams and your pending engagement! Before shopping for an heirloom quality ring, it would be wise to invest some time learning about diamonds and their attributes, settings and pricing for rings. With an understanding of the 4 c’s of diamonds: color, cut, clarity and carat along with common stone settings, you will be poised to make the perfect purchase for the perfect woman. When considering ring options pre-purchase one should take into consideration their fiancée’s lifestyle, fashion taste and budget. For an active bride-to-be, heavy consideration should be given to the elegant and timeless bezel setting. With a multitude of precious metals for bands coupled with varying sized diamonds, the combination for bezel set engagement rings is infinitesimal. What Makes the Bezel Setting So Appealing? Long regarded as the earliest method of setting gemstones into jewelry, in the bezel setting, the diamond is surrounded in its entirety by a metal band which secures the diamond in place. With the diamond rim wrapped in a protective edging, the stone is well protected compared to a comparably set stone with prongs. Encased in precious metal, the diamond will remain shrouded in protection for the duration of its lifetime. Common bumps, nicks and snagging so often experienced with engagement rings will not be a problem for your fiancée with a bezel set showpiece. Where Can I Buy a Bezel Set Ring? As with most engagement rings, bezel set engagement rings are available at major jewelry retailers nationwide, regionally and locally along with a number of online websites. For the discerning buyer, Tiffany’s offers a popular bezel setting known as the Etoile. Unlike other jewelry acquisitions, rings are an extremely challenging purchase as there is the complex element of fit involved. If you know your fiancée’s ring size, you are off to a good start.However, as all rings fit slightly differently, the ring may require resizing after the proposal. Is there an existing heirloom ring that a family member would allow you to offer your fiancée? 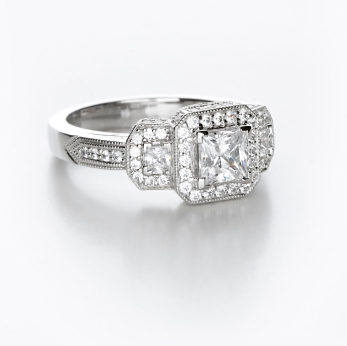 Do you have access to a diamond or other gemstone that you could have set into a new ring for your fiancée? Consider a slightly flawed diamond or different metal for the band. Engagement ring shopping, like so many other things in life require strong negotiation skills. As you are dealing with a commodity, there will likely be little leeway in the price however it never hurts to attempt negotiation. If you plan on proposing around the holidays, look for sales from your favorite store. While you may lose some of the ability to customize the ring, you may be pleasantly surprised by the offerings. In addition to a price break on the ring, know that jewelers may offer free cleanings, stone checks or insurance appraisals in lieu of a reduced price. All are important in the lifespan of owning a ring and should be considered. Only time will tell if the purchase measures up to expectation. However, as the saying goes “a diamond is a girl’s best friend” and this cliché is never truer than when applied to an engagement ring. Presenting your future spouse with a beautiful custom selected bezel set ring is the perfect start to your life together. Additionally, if your significant other has dropped hints regarding a specific style, setting or precious metal, weigh heavily on her wishes and desires to ensure her utmost happiness. After the proposal is behind you the quest to plan the perfect wedding will begin. Before you start with the planning, please ensure that your fiancée’s new engagement ring fits perfectly. If not, your fiancée should take the time to get the ring properly sized by a qualified professional. Additionally, as with all heirloom jewelry, consider an insurance rider on the ring. Before insuring the ring, your agent or insurance company will likely require a detailed appraisal of the piece. Consult your carrier for their specific needs before requisitioning an appraisal. With days, weeks, months or years of time invested in the hunt for the perfect engagement ring, please know that you will again be faced with ring shopping tasks during your engagement. With the perfect bezel set ring on the finger of your beloved, take the time to find a wedding band that mirrors or enhances the appearance of her new engagement ring. An engagement ring represents so much more than a diamond set in a band. It represents the promise of things to come, a lifetime together and all the hopes and dreams you share as a couple. Presenting your fiancée with a gorgeous bezel set ring is a once in a lifetime memory that you will cherish together. With its protected stones, bezel set rings will offer your fiancée a lifetime of enjoyment with her new ring. Congratulations on your upcoming engagement and all the best to you and your fiancée! As the ring is designed for a lifetime of wearing and enjoyment, should the initial purchase not fit, please make time to get it properly fitted. An ill-fit ring is prone to often prone to being lost or damaged. With an upcoming wedding, you may be looking for ways to save on the purchase of an engagement ring. First, please be mindful that this is a piece of jewelry that will be with your fiancée for the rest of her life. As such, whenever possible, try to avoid cost-cutting measures that would undermine the value of a future family heirloom. Next, be realistic with your budget and what you are able to spend. Putting yourself in debt for a purchase, no matter how special your fiancée, is something most financial gurus would frown upon.